The Greeting to the Sun was created in 2008 by the Croatian architect Nikola Bašić in the city of Zadar (Croatia). This work is located just a few meters away from the Sea Organ (1), by the same author. Together, these two inspiring public art installations create a magical atmosphere as a complement to Zadar’s promenade. This viewpoint is also recognized as one of the best places in the world to contemplate the sunset. The Greeting to the Sun is composed by 8 + 1 walkable installations representing the Solar System. The size of the planets are proportional, but not the distance between them. The main circle represents the Sun, and it is composed by solar powered modules with a lighting system. The modules catch the sunlight during the day and, when the night comes, the installation shows a performance of lights created by a computer that generates random patterns of lights. The Greeting to the Sun has further interaction possibilities such as the customization of the pattern, creating logos or even texts. The work can be used for special events to recreate specific lighting shows or to be synchronized with the Sea Organ to represent the waves’ movement. 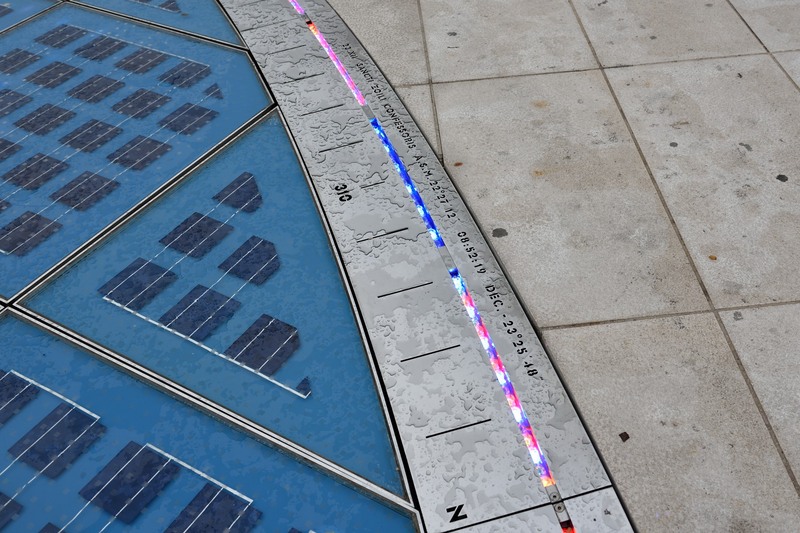 Over the external ring, the visitor can read the names of the 36 representative Zadar’s saints together with the coordinates of the Sun’s position during the year corresponding to each Saint’s feast. Since 2007 I have been collecting information about artists behind solar powered artistic installations around the world. It is always a personal satisfaction to visit an artwork previously studied. In this case the visit acquires a new dimension, becoming some sort of pilgrimage. Whenever I introduce Solar Art through a keynote with several examples, the slide about the Greeting to the Sun is usually the one that raises more interest and questions. This work is a special case for several reasons: the characteristics of the installation suppose a complex technical challenge; it is a landmark in the area with a clear impact as a touristic attraction; the spectacle of lights once the Sun sets, accompanied by the surrounding landscape, creates a perfect environment for the public to enjoy this smart example of the possibilities of implementing solar power and other new technologies in contemporary public art… In other words, we can consider the Greeting to the Sun as the first internationally acclaimed permanent solar public art installation. There are a few articles on the Internet with reliable information about the Greeting to the Sun, including one very interesting interview with Nikola Bašić by Barbara Stelluti (2). Technically speaking, the Greeting to the Sun is a circle of 22 meters of diameter composed by 300 solar PV modules seized ~100x100cms with 25 poly-crystalline cells each. To shape the circle, peripheral modules are customized with rounded edges, with variable amount of solar cells inside (some of them also “customized”). These modules have a thick walkable glass (multiple layers with a total thickness of ~5cms) that makes the installation resistant enough so people can walk on it. Modules have numerous small squared dots to avoid the slippery effect of the surface (although we tested it did not work so well when it rains). There is a space between the modules and the ground of ~15cms. 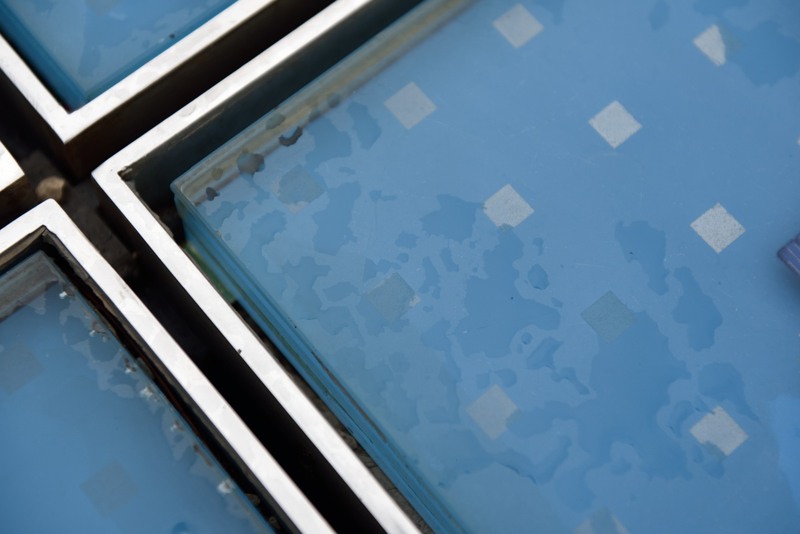 The joints between panels vary between ~1cm and ~2cms and there is no specific protection between modules (you can “put your finger” inside the joints between them). This “open” structure may help to avoid overheating and condensation issues when the lighting system is fully operational. On the other hand, I guess there must be an efficient draining mechanism to avoid floods in case of heavy rain and special insulation materials to combat the corrosion from the sea. The lighting installation is composed by a grid of LED lights (~10,000 units) located underneath the modules. Due to the wide separation between the solar cells, the light comes up through the glass to create the artwork’s characteristic effect. The whole system is connected to the grid, contributing to reduce the final bill of the energy consumption. References on the internet affirm that the Greeting to the Sun produces ~46,500 kWh per year and it reduces the energy demand of the area to a third. The cost of the project was ~1.3 Million Euros, with an annual maintenance bill of ~100 Thousand Euros. The Greeting to the Sun has a power of attraction difficult to see in other public art installations today. People experiment a mix of curiosity and fascination to something so innovative and accessible. It doesn’t matter what hour of the day you visit the artwork, there will be always people walking on it. During the day, visitors follow the sound created by the Sea Organ, sitting next to it waiting for the sunset. Once the Sun is gone, the Greeting to the Sun catches all the attention with its powerful lighting spectacle. In a place with a studied dimmed landscape illumination, the patterns created by the Greeting to the Sun contrast with the shadows of the people and their own movement. Public’s reaction is really interesting: some sit down, some walk around, some start to dance… and kids just run amazed following the lights. In my case, after the initial shocking moment of visiting for real a revered artwork, I really enjoyed the experience of two evenings with this masterpiece. The Greeting to the Sun is an excellent example of how public art can transform the image of a city, creating an international call effect for tourism. This project shows how technology and site-specific public art can combine to create something unique that cannot be duplicated in other place with the same meaning or impact.